Lincoln Park's boundaries are precisely defined in the city's list of official community areas. It is bordered on the north by Diversey Parkway, on the west by the Chicago River, on the south by North Avenue, and on the east by Lake Michigan. It encompasses a number of neighborhoods, including Lincoln Central, Mid-North, Old Town Triangle, Park West, RANCH Triangle, Sheffield, West DePaul (including half of the Julia C. Lathrop Homes) and Wrightwood Neighbors. The area also includes most of the Clybourn Corridor retail district, which continues into the Near North Side. Lincoln Park is home to Lincoln Park High School, Francis W. Parker School, and DePaul University. Many students who attend these schools now live in this neighborhood. Lincoln Park is also home to four architecturally significant churches: St. Vincent de Paul Parish, St. Clement Church, St. Josaphat's (one of the many so-called 'Polish Cathedrals' in Chicago), and St. Michael's Church in the Old Town Triangle area of Lincoln Park. Visible from throughout the neighborhood, these monumental edifices tower over the neighborhood, lending the area much of its charm. The neighborhood also houses Children's Memorial Hospital (recently moved to Streeterville) and the currently closed Lincoln Park Hospital, which is slated for redevelopment to condominiums, medical offices, retail and commercial to be renamed Webster Square. The neighborhood contains large number of upscale national retailers, boutiques, bookstores, restaurants and coffee shops. An Apple Store opened in October, 2010, as well as a Lacoste store across the street. There are also many bars and clubs in the area, especially along Lincoln Avenue between Wrightwood and Webster. 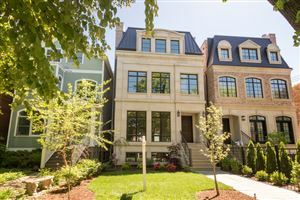 Lincoln Park is one of the wealthiest and most expensive communities in which to live. While the average single-family house is priced around 1 million dollars, many homes in the area sell for more than 10 million dollars. In 2007, Forbes magazine named the area between Armitage Avenue, Willow Street, Burling Street, and Orchard Street as the most expensive block in Chicago.